Background: DNA-binding proteins, binding to DNA, widely exist in living cells, participating in many cell activities. They can participate some DNA-related cell activities, for instance DNA replication, transcription, recombination, and DNA repair. Objective: Given the importance of DNA-binding proteins, studies for predicting the DNA-binding proteins have been a popular issue over the past decades. 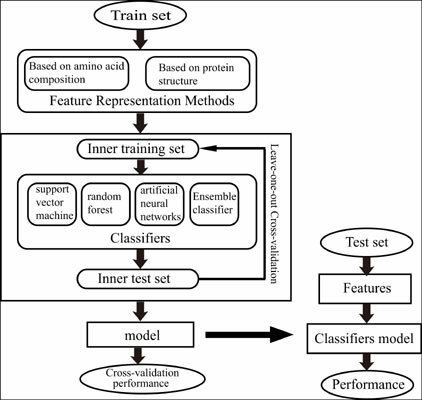 In this article, we review current machine-learning methods which research on the prediction of DNA-binding proteins through feature representation methods, classifiers, measurements, dataset and existing web server. Method: The prediction methods of DNA-binding protein can be divided into two types, based on amino acid composition and based on protein structure. In this article, we accord to the two types methods to introduce the application of machine learning in DNA-binding proteins prediction. Results: Machine learning plays an important role in the classification of DNA-binding proteins, and the result is better. The best ACC is above 80%. Conclusion: Machine learning can be widely used in many aspects of biological information, especially in protein classification. Some issues should be considered in future work. First, the relationship between the number of features and performance must be explored. Second, many features are used to predict DNA-binding proteins and propose solutions for high-dimensional spaces. Keywords: DNA-binding protein, prediction, feature representation methods, measurements, classifiers, web servers. Keywords:DNA-binding protein, prediction, feature representation methods, measurements, classifiers, web servers. Abstract:Background: DNA-binding proteins, binding to DNA, widely exist in living cells, participating in many cell activities. They can participate some DNA-related cell activities, for instance DNA replication, transcription, recombination, and DNA repair.